The past two weeks has been a time of sudden activity up on the Hill. Summer is a time when many people are preoccupied with other activities — family, friends, dealing with your job while others are on vacation, and often catching up! It seems like it is also the time when Congress decides to "get busy!" It has been amazing how many times over the last 11 years that something "big" happens while CASE is having our annual Legislative Summit! I cannot promise you anything special this year but if these past two weeks are an example, something will be happening! Be sure your voice is heard while you are busy with family and friends this summer ... CASE and CEC will be your voice but remember, we need to hear from you. Almost 700 of you have completed the IDEA survey — if you haven't, do so right now by clicking here. 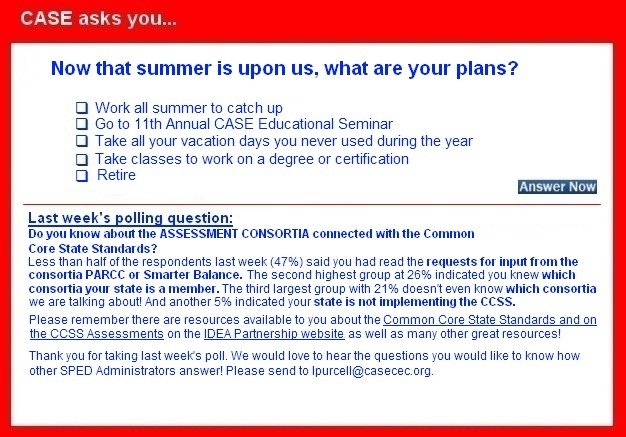 Don't forget if you are not a CEC/CASE member, from now until July 10 is a great time to join! With this special membership application, you get $10 off the CEC cost and a copy of the latest Lucky 21 book from CASE! Forward the special membership application for CEC and CASE to your colleagues who are not members! If you really want to make a difference, then you need to register now for the 11th Annual CASE Legislative Leadership Seminar, July 14-17. This annual seminar will reinforce the importance of one added to a strong voice. Last year 78 CASE members from 25 different states met with their senators and representatives to discuss the issues concerning students with disabilities. We need your voice. We will be at a different hotel this year — the Hilton Alexandria Old Town — just across the street from the King Street Metro Station. For more information and links to both the hotel and seminar registration, go to the CASE website. Not a member of CEC/CASE? CASE will be glad to post job positions each week — Please send to Luann Purcell, executive director by Tuesday of each week for posting the next week. It should be about a paragraph in length but you can attach a PDF document that interested persons can then click through to for more information or you can provide a URL link for the same purpose. Please indicate at what date the post should be pulled not to exceed 6 weeks. BEST TEACHERS KNOW WHAT WORKS! Enhance your current curriculum or use independently to increase students’ success. See more on the web-link below. CEC has initiated a search for an Executive Director to replace Dr. Bruce Ramirez who will retire on June 30, 2013. His long tenure of service to CEC has been greatly admired and appreciated, and we wish him all the best as he moves into the exciting next chapter of his life. CEC's growth as the voice and vision of special education is of major importance to all of us. To ensure our ability to lead the future of our profession, we engaged a recruitment consultant to help us identify the skills, credentials, experience and characteristics needed in our new Executive Director. Click Here for the Announcement (Exhibit A) and the Job Description (Exhibit B). Special education postings for La Porte Community School Corporation (Indiana) include Special Education Teacher, Community Based Teacher, Psychologist, Special Education Diagnostician and HS teacher — in some instances, the posting will indicate the date for application is passed but these positions are still open — please contact Janet Kelly, So. La Porte County Special Education Co-op 219-324-3287. The Columbia MO Public School District is accepting applications for Special Services Teachers (K-12 Special Education certification) for the 2013-2014 school year. At this time we have several openings at the secondary level and we are actively interviewing candidates. All teaching candidates must complete a profile, attach a resumé and unofficial transcripts, and apply through the Human Resources site on the Columbia Public website: www.columbia.k12.mo.us. For more information, please contact the Human Resources Department of Columbia MO Public Schools at 573 214 3400. Needed: 2 teachers of the deaf — 1 teacher working primarily with the elementary/PK and 1 position working primarily with the middle and high school students. We are in Pasco, Washington — the "Tri City" area of south central Washington State. Candidates contact Tracy Wilson with any questions. Position is Open until filled- currently as of 5/18/13 both positions are open. We are looking for students with strong ASL skills, able to meet the Federal Highly Qualified Credentials, be eligible or willing to work on obtaining the special education credential Washington state prefers. For additional information, click here. An overwhelming show of support for global accessibility was unmistakable, as Senate Building room 106 filled with disabilities rights advocates on June 5. Attendees gathered for the Enabling briefing and panel discussion for the Convention on the Rights of Persons with Disabilities. Panel members included Francis West of IBM, Judy Weber of World Wide Web Consortium, Andrew Kirkpatrick of Adobe Systems, Brian Markwalter of Consumer Electronics Association, and David Dikter of Assistive Technology Industry Association. As Senators on the education committee continue to debate the reauthorization — rewrite — of the Elementary and Secondary Education Act, one thing is clear: the future vision for public education is drastically different among Democrats and Republicans. Members of the House and Senate introduced several education-related bills, including a Senate proposal to reauthorize and amend the No Child Left Behind Act. A small change tucked inside a government spending bill may have big implications for special education. Lawmakers included language clarifying the penalties that states may face if they fail to adequately fund education programs for students with disabilities. ADHD: How many children are misdiagnosed? A year ago, psychiatrist Leon Eisenberg, considered to be the "scientific father of ADHD," was quoted in a last interview before his death as saying that "ADHD is a prime example of a fictitious disease." A new brain imaging study of dyslexia shows that differences in the visual system do not cause the disorder, but instead are likely a consequence. The findings, published in the journal Neuron, provide important insights into the cause of this common reading disorder and address a long-standing debate about the role of visual symptoms observed in developmental dyslexia. Dyslexia is the most prevalent of all learning disabilities, affecting about 12 percent of the U.S. population. Beyond the primarily observed reading deficits, individuals with dyslexia often also exhibit subtle weaknesses in processing visual stimuli. In a study of the co-occurrence of attention deficit hyperactivity disorder and autism spectrum disorder in early school-age children (4- to 8- years-old), researchers at the Kennedy Krieger Institute found that nearly one-third of children with ASD also have clinically significant ADHD symptoms. Published in Autism: The International Journal and Practice (Epub ahead of print), the study also found that children with both ASD and ADHD are significantly more impaired on measures of cognitive, social and adaptive functioning compared to children with ASD only. A special education teacher is in hot water after allegedly posting photos of student tests and notes from parents on social media appended with demeaning commentary. The posts were discovered by a parent who said that when searching the Internet for her son's teacher at Bennet-Kew Elementary School in Inglewood, Calif., she came across photos of tests and other documents, some of which included the names of students. There were also comments about the students' parents with one reading "I have the dumbest parents in my class." For most of her childhood and adolescence, school was a struggle for Karen Tillery. Reading caused painful headaches, teachers' lectures were garbled with the voices of her classmates and new concepts didn't register immediately, if at all, and the reasons why were a mystery. "She wasn't able to do questions, comprehension and had difficulty spelling. She was distracted and couldn't focus," said Lisa Tillery, mother of the 17-year-old Mesilla Valley Christian School student. Members of the House and Senate introduced several education-related bills, including a Senate proposal to reauthorize and amend the No Child Left Behind Act. Sen. Tom Harkin, D-Iowa, who sponsored that bill with other Democrats, said the goal of the bill is to codify some of the flexibilities that the Department of Education has given to states as they try to meet NCLB standards. "We ask for a system of shared responsibility with States and school districts," Harkin said of his bill, S. 1094. "I believe that we are entering an era in which the federal government can work in partnership with States to improve our nation's schools, while continuing to provide a backstop to avoid returning to old ways." Governors and education chiefs from nine states said Tuesday that a focus on early-childhood education, the changing dynamic of families and supporting low-income students could help improve literacy across the country. Discussing the nation's literacy crisis at a Washington Post policy forum in the District, the panel of political and education leaders said states need to do more to help children learn to read by the third grade, a key educational milestone at which children shift to "reading to learn." Those who can't read proficiently by third grade are more likely to struggle in later grades. Renewing the effort to revise No Child Left Behind, the signature Bush-era federal education law, Sen. Tom Harkin, Democrat of Iowa, introduced a new version that he said would "replace the failed tenets" of the law. Less than two years after Congress last tried to update the law, which governs public schools that receive federal money to support the country's most disadvantaged students, Harkin, chairman of the Senate education committee, opened what is likely to be a fierce debate over the proper role of the federal government in public education. Congress is taking up the reauthorization of the Elementary and Secondary Education Act. Here's what you need to know if you are a parent of a student with learning disabilities. Passed in 1965, ESEA is the nation's oldest and largest federal education law. The provisions of ESEA are aimed at making sure that all children — including those with disabilities — have an equal opportunity for a high-quality education. ESEA also provides funding to schools with students underperforming in reading or math. In the 181,500-student Fairfax County, Va., school district, students with disabilities represent about 14 percent of the enrollment but are involved in about 40 percent of all discipline cases, according to school officials. At a county school board work session, members focused on the disparity as they reviewed proposed changes to the district's discipline policies aimed at making school administrators more sensitive to the needs of students with disabilities. A new brain imaging study appears to rule out one potential cause of dyslexia, finding that vision problems don't lead to the common reading disorder. The new research could have a wide-ranging impact on the detection and treatment of dyslexia, said senior study author Guinevere Eden, director of the Center for the Study of Learning at Georgetown University Medical Center. The study appears June 6 in the journal Neuron. The members of AASA, the school superintendents association, are committed to guaranteeing to every American child a public education that develops his or her achievement in each of the areas that traditionally have been goals of American schools. First and foremost, our schools should promote good citizenship, including the habit and practice of participation in civic life by voting — as well as by contributing to community well-being in voluntary association with fellow citizens. High achievement includes the organizational and collaborative skills needed to participate effectively in our democracy and practice in the nonviolent resolution of conflict. In an effort to improve long-term outcomes, a leading group of pediatricians says doctors should routinely evaluate babies and young children for motor skills delays. The American Academy of Pediatrics said in a clinical report published this month that motor skills assessments should be incorporated into the developmental screenings recommended to take place at well-child visits at ages 9, 18 and 30 months. Previously, such evaluations primarily emphasized language and social development. Parts of the brain thought to support consolidation of emotional memories during sleep are less active in children with attention-deficit hyperactivity disorder, according to a new study. This deficit in sleep-related emotional processing may worsen the emotional problems of children with this condition, researchers in Germany report. Children with ADHD have difficulty sustaining attention, and often display hyperactivity and impulsive behavior. The neurobehavioral disorder affects 3 percent to 5 percent of U.S. children, more of them boys than girls. Dyslexia is the most prevalent of learning disabilities, affecting nearly 12 percent of Americans with reading disabilities and difficulties processing visual information. For a long time, scientists felt that dyslexics had an altered capacity for vision in their brains. This would make sense, as learning disabilities, such as autism, are often caused by differences in brain chemistry and development. Many elementary students' math performance improves when their teachers collaborate, work in professional learning communities or do both, yet most students don't spend all of their elementary school years in these settings, a new study by UNC Charlotte researchers shows. Collaboration involves teachers working together to promote student achievement. A professional community exists when teachers feel a sense of belonging to a school, take pride in the school, understand and accept the school's mission, and are constantly learning strategies to improve student achievement. 11th Annual CASE ELLS Washington, D.C. July 14-17 More information to come. Fall Board of Directors Meeting Indianapolis, Ind. Sept 25-26 More information to come. 24th Annual CASE Conference Indianapolis, Ind. Sept 26-28 More information to come.